Finding the apparels that fit you perfectly is a little bit tough task. Because customers get exhausted in locating a good tailor and they go for multiple fitting sessions until they get satisfied. Thus the demand for custom & bespoke tailors increases every day. Nowadays many tailors have their presence on the online platform. But they fail to succeed in the online tailoring platform. The reason behind their lack of business success in the online platform is due to the online tailoring business website. Many tailors fail to update their online tailoring business website with the current technical features. "Applying advanced technology in tailoring business website can double up the tailoring business profit". This cynical phrase was said by many business experts. So tailors should update their tailoring business website with the high-end application to satisfy the requirement of the end user starting from the selection of the fabric till the payment gateway. Make your online tailoring business website as an inspiring one. 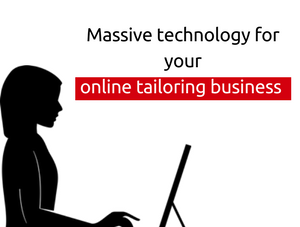 know more innovative addons to embrace your online tailoring business website. See the infographics below to know more about the working of online tailoring business store.